Save The Date! 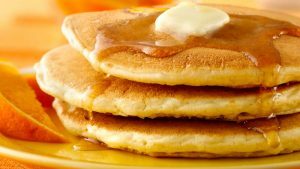 November 27th is CORBA’s Annual RAM Ride & Pancake Brunch! President’s Message: Thank You Mark Langton! Mark Langton was one of CORBA’s founders in 1987 and one of IMBA’s founders in 1988. He served 13 years on CORBA’s steering committee, and subsequently joined the CORBA Board of Directors. He has served as CORBA’s president, as one of the first volunteer patrollers for the Mountain Bike Unit and he’s taught the CORBA Introduction to Mountain Bike Skills Class every month since 1992. Now after 29 years, he’s stepping down from the CORBA Board as of December 2016. CORBA’s approach has always been to show up, to participate, to take the high road and to be persistent. Mark has done all that and more. He’s been deeply connected to the sport as a racer and for several years as the editor of Mountain Biking magazine. He was the co-author of Riding Santa Monica Mountains Best Trails with Jim Hasenauer and of Where to Bike Los Angeles Mountain Biking with Jim Hasenauer and Steve Messer. He also wrote the Outdoor Action Guide Mountain Biking, and a skills manual, Mountain Bike Master: Essential Skills and Advanced Techniques Made Easy. He worked as Director of Communication for Giant Bicycles and for the National Off-Road Bicycle Association, before it was absorbed by USA Cycling. His knowledge, his ability to communicate and his industry connections brought national attention and resources to CORBA. 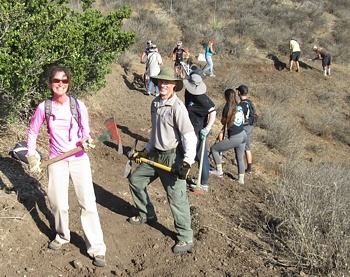 When the Conejo Opens Space Conservation Authority began dealing with the same trail access issues as the nearby Santa Monica Mountains agencies, they took a more open, community-minded approach. They told the complainers “These trails will be shared by the community. 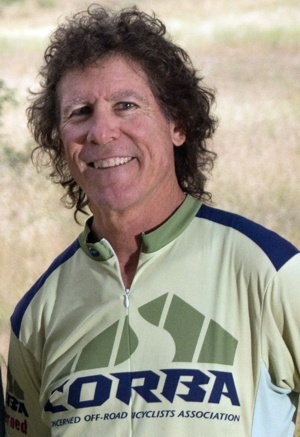 Work it out.” Mark was one of the founding members of the new Conejo Open Space Trails Advisory Committee and his efforts built strong alliances with equestrians and hikers. For years, COSTAC has been a model of user cooperation and the power of education in not only reducing user conflict but building a strong, united, and inclusive trail community. For more details, especially on Mark's early years helping to form CORBA and IMBA, and challenges faced by mountain bikers in those days, (and a few more pictures), read our Thank You Mark blog article. Come join CORBA for our annual RAM (Ride & Mingle) event and pancake breakfast at Michael’s Bicycles in Newbury Park! November 27th! Ride time 9am sharp: Meet at Wendy/Potrero Drive in Newbury Park. ALL LEVELS WELCOMED! GUIDED RIDES: BEGINNERS, INTERMEDIATE & ADVANCED ROUTES. Come ride with us in Point Mugu State Park (Sycamore Canyon). Meet at Wendy/Potrero in Newbury Park. We will all ride over to the ranger station for a big group photo then split up into our groups. Pancake brunch at Michael’s Bicycles after the ride at 12:30pm. $10 suggested donation. You can renew or purchase a CORBA/IMBA Membership as well! With Mark Langton leaving CORBA’s Board of Directors, we put out a call for Board nominees. We’re happy to announce that we have welcomed two new board members, Scott Mabbutt and Joyce Deprest. Scott is a respected filmmaker, storyteller and self-declared cat whisperer. He is a member of the Mountain Bike Unit (MBU), a group of mountain bike volunteer patrollers that work closely with the National Park Service, California State Parks and the Mountains Recreation and Conservation Authority (MRCA) patrolling the Santa Monica Mountains to assist and educate visitors on the trail. Scott can be found somewhere in the Santa Monica mountains every weekend. Also joining the CORBA board is Joyce Deprest. Joyce is an MBU member and patroller, with her favorite place to ride or patrol being Point Mugu State Park. She has been instrumental in re-introducing MBU members to do trailwork. Joyce is a native San Fernando “Valley Girl.” Her professional life began working in Non-Profit Organizations, including event planning, office management and as the Director of a Synagogue in the San Fernando Valley. During the past 6 years Joyce has rediscovered her love of the mountains, canyons and oceans. To learn more about Scott and Joyce, read our blog on the new board members. Even though the rides got rained out, the festival was still a success and everyone made the best of it. The rain came down pretty hard most of the morning. 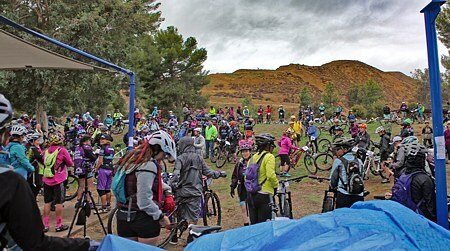 I know how rough it was at times… yet 237 riders still showed up! Despite the rain, participants in the Skills Clinics enjoyed the opportunity to brush up on their technique! I feel very strongly the right decision was made NOT to ride the trails. Myself and many others pour our heart and souls into this event every year, so this decision not to ride was not made lightly… Not only would we destroy the trails, it could have done a lot of damage to your bikes (clay soil sticks to everything) and it would have become dangerous. We respect the trails; we don’t ride in the mud and destroy the land. And view the almost 250 photos in our photo gallery! COSCA Annual Trailwork Day, October 15. Continuing a trend from the past few years, we improved and extended trails in the Western Plateau/Conejo Canyons region of Thousand Oaks. 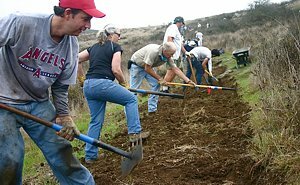 Of the 120 volunteers expected for the event, about 60 were put into six crews that worked on building a bypass to the very steep bottom of the Peninsula Trail. The other half were assigned to six crews to work on two other trails leading down to the canyon, but some distance from the Peninsula Trail. The CORBA crew and other mountain bikers worked on the Peninsula Trail. The project was to build a new, much less steep trail that would replace the bottom section of the Peninsula Trail. It was to be about 0.35 miles long. Most of the new trail crossed a fairly steep slope, and some sections of the cross slope were very steep. That meant that we had to dig a lot of dirt out to make a trail. Overall, we must have moved several tons of dirt! The thank-you barbecue lunch, cooked up by the COSCA rangers, started at noon, and one of the CORBA volunteers won the grand prize, a Giant mountain bike, in the prize give-away at the end. You can see the full report, including a time-lapse video, on our 2016 COSCA Trailwork blog report. And you can directly view the activities at the event photo gallery. Our friends at the Santa Monica Mountains Trails Council are in the running for a considerable donation towards maintenance of the Backbone Trail. Anheuser-Busch is giving away up to $200,000 for trail maintenance around the country through the Michelob Ultra Go The Extra Mile Fund. Here’s the catch: the public decides how much of that pie each nominated trail will receive. Twelve trails have been nominated, including the recently completed Backbone Trail in the Santa Monica Mountains. The funds will be divided between the twelve nominated trails, based on the percentage of votes each trail receives. Votes must be cast by November 30th, and you must be at least 21 years of age to visit the site and vote. Every vote makes a difference! Vote now for the Backbone Trail! 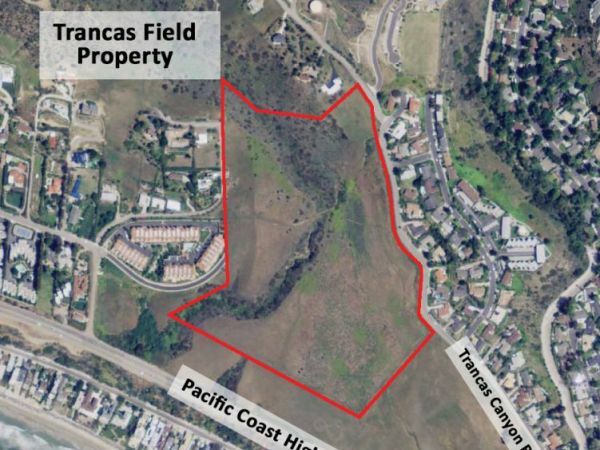 The city of Malibu is asking the public what type of facility we want at Trancas Field. They are conducting an online survey. If you live in or near Malibu, we need your votes! If you don’t live in Malibu, but would visit a bike park there, we need your votes too. In question #1 fill out your Contact Information. and for # 11 choose the “Skate Park” and ALSO “Bike Pump Track”. You don’t have to fill out anything else unless you see something you like. 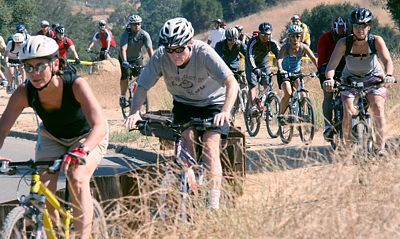 We recently had a bike park approved in Thousand Oaks, and next week we’re hoping the LA County Board of Supervisors will approve the proposed bike park at Puente Hills Landfill. Let’s keep this train rolling! On October 10, 2016, the Thousand Oaks Planning Commission held a hearing on the Sapwi Trails Community Park master plan. After the City Planner summarized the plan and 15 people commented on the project, the Planning Commission voted to approve the project. Next steps will be a planning process for the bike skills park. The master plan only identifies the approximate location of the bike park, and is not a bike park design. The bike park will be planned through a series of public meetings sometime in mid-2017. 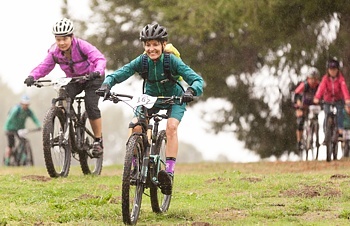 One of the Commissioners noted that she felt the City had enough traditional parks and welcomed this plan incorporating several alternative recreation opportunities including mountain biking, cross country running, model glider flying, and frisbee golf. The Plan can be found here, and CORBA’s testimony can be found here. To see more details about this meeting, check out our blog article. Saturday November 5th is the next skills clinic.